International relations theories are confronted to radical change, actually, non linear political phenomenas on the world political stage in plenty of sectors : economic, cultural, military, etc. First, one notices that well known theories, realism, liberalism and constructivism are still the mainstream of international relations debate. 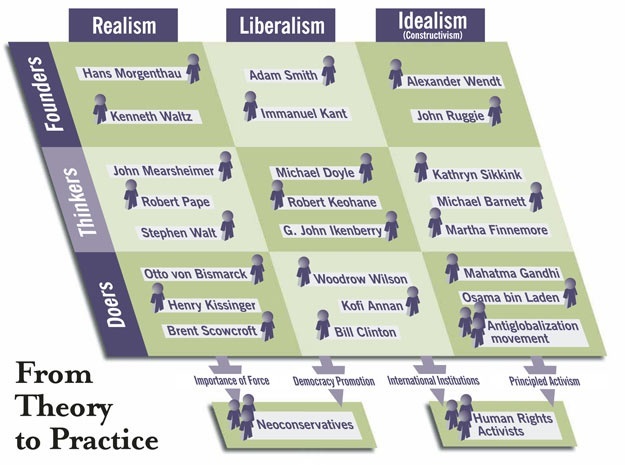 Remember that realism focuses on the balance of power and the distribution of capacities, liberalism on the spread of democracies and constructivism on the increasing strength of norms on the States political will. 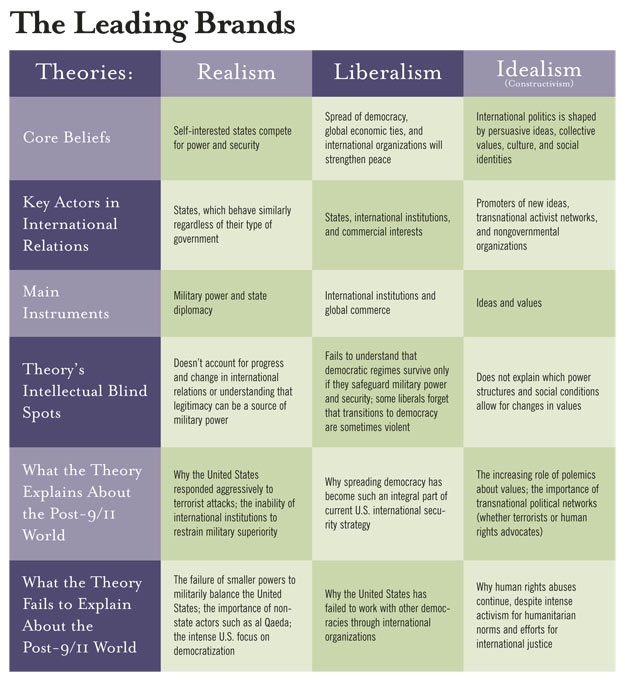 In the public sphere, the contemporary security dilemmas facing by policy maker are mostly describe by one of these frameworks. From a realist perspective, the main explanation is coming from the global struggle for power among self interested States. As a consequence, a policy maker should draw careful decisions to mitigate the rising risk of conflict among great powers. Chinese foreign policy is a common example of such trajectory by modernizing its economy and slowly developing its military forces to assert first its regional leadership then and very soon, a more global one. However, realists have difficulties to interpret the emergence of non state actors and their associated threat upon the balance of power of region such the Middle East. But, the new democratic countries must go through an transition phase which very often lead to ethnic conflict, civil war of regional violence. The democratic legitimacy of a government is the result of a long historical process which may be incompatible with an international environment structured by the rivalries of great powers within an United Nations freeze by its embedded liberal norms. It is the classical historical cases of disruption of a traditionnal society by the introduction of market mechanism and liberal norms during the XIXth century. Finally, constructivism favored a foreign policy grounded in moral and legal principles. It provides an explanation of the reality by the social process of dialogue on values which enable severals actors to build a common framework to sustain the identity and interests of each one : « people’s understanding of their interests depends on the ideas they hold ». As a result, an activist network may implement an communication strategy to « name and shame » actors whose policy deviates from moral standards to press the international community to regulate these actors. But the difficulty is coming from the definition and justification of appropriate behaviors. Both networks as Al Qaeda and Human Right Watch are transnational, held their motivations from principles, the Human Rights vs. Sharia, and challenge the sovereignty of States ; but which one is able to define the « standard » behavior a government should follow ? If the new international order will come from shared understanding about the definition of the common rules of the international community, the constructivists cannot assert, at the same time, that western standards and liberalism are the most suited one ! In conclusion, « each traditions as a check on the irrational exuberance of the others ».